Protected by extended Wing Walls, this long, plastic Hallmark Front-Mount Grid Scan Hook provides added length for additional items, helping insure no lost sales due to out-of-stocks. Again as part of a temporary seasonal promotion, the economy of Plastic is not a shortcoming. A molded in Label Holder provides pricing and promotional support if desired, though unused here. 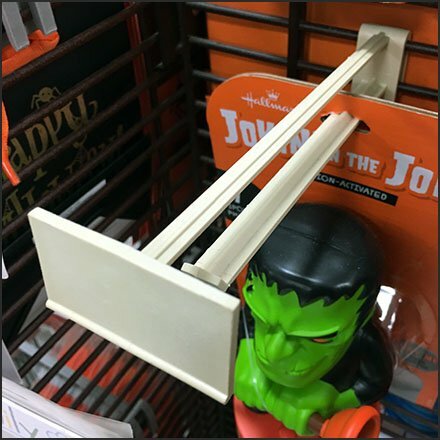 This Hallmark Front-Mount Grid Scan Hook seen as part of a mobile Halloween holiday display.